Shannon Briggs: I Came All The Way From America And They Won't Let Me In! A number of big names were in attendance at today’s Anthony Joshua-Alexander Povetkin weigh-in in London. Rival heavies Dereck Chisora and Dillian Whyte were there, the two attempting to make a deal, as in the purse split, for their possible (though not yet finalised) December rematch. Pundits Carl Froch, Johnny Nelson and Paulie Malignaggi were also in attendance. So was Hearn guilty of giving the order to keep Briggs out? Was the promoter perhaps worried “The Cannon” would take a pot-shot at Chisora or at Whyte – or at Joshua? Briggs, a whole lot of fun, has been inactive since May of 2016 and he needs a fight; any fight. “I come in peace,” a smiling Briggs said to the security guys who said they were not permitted to let him in. Briggs, though, was clearly disappointed at not being allowed within the inner perimeter, having instead to console himself with the fan affection he was showered with. Who knows what Briggs, 60-6-1(53) wanted to do, what he would have done, had he gained access. Still, Briggs is unlikely to leave town just yet, not until the Joshua-Povetkin fight has been fought. Will Briggs be barred from the arena tomorrow night, too? Or has the jovial 46 year old bought himself a ticket, therefore ensuring he will be there with bells on? Briggs is a great talker and he only adds fan attention to the events he does turn up at. He’s not to everyone’s taste, but Briggs would almost certainly do a good job as a Sky Sports analyst. And Briggs would probably perform this service for free while he’s in town. What do you think, should “The Champ” have been allowed in today? 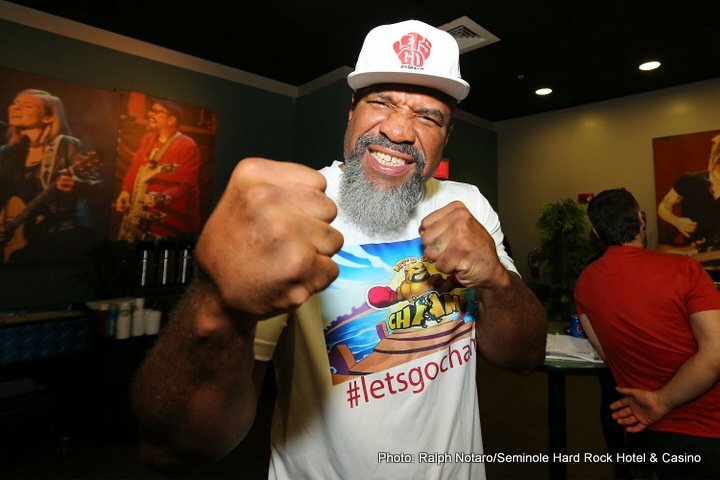 You are here: Home / Boxing News / Shannon Briggs: I Came All The Way From America And They Won’t Let Me In!